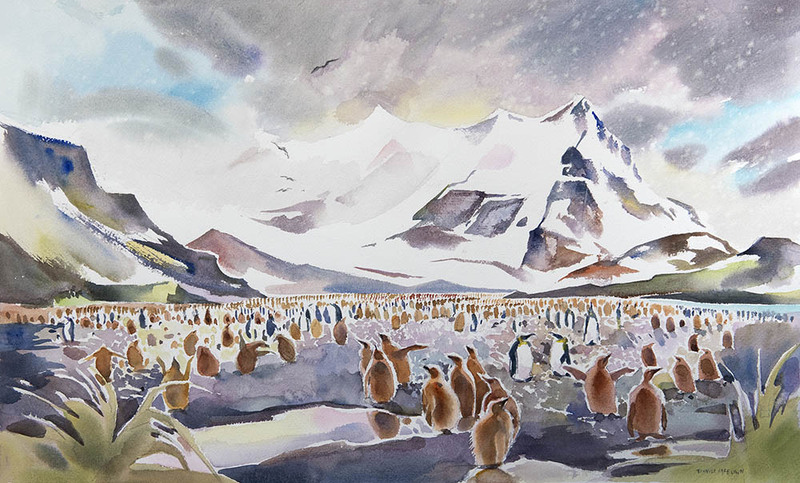 The attached video clips and paintings were inspired by a trip to the Sub Antarctic Island of South Georgia in October- November 2018. 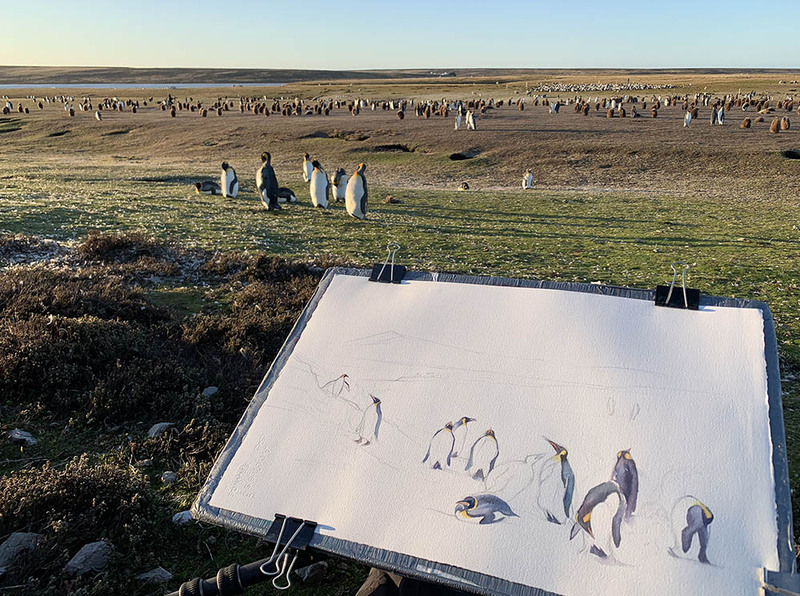 We departed by ship from the Falkland Islands where I had time to warm up the brushes and spend time painting at a wonderful nature reserve of Volunteer Point. The South Georgia trips were in particularly rewarding as we participated in a photo symposium led by some of the finest photographers in the field. 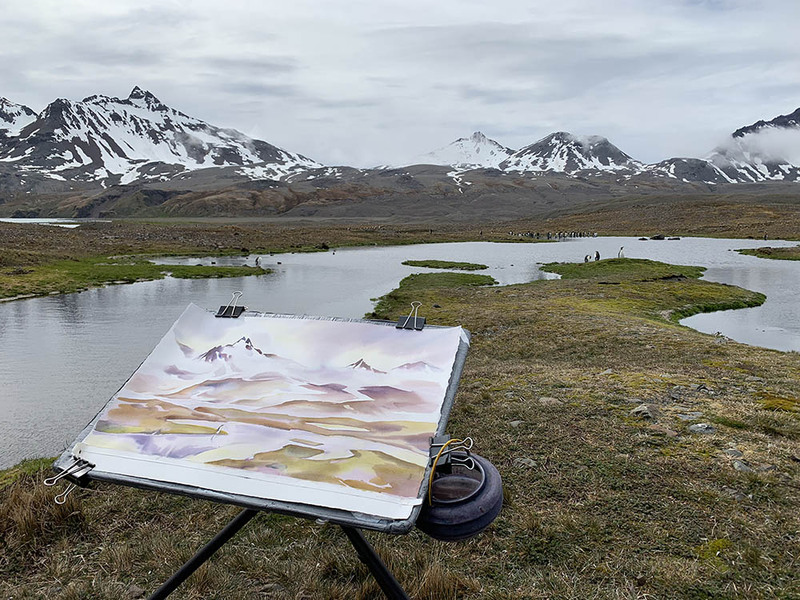 It was great to be in nature with so many folks engaged in he art of seeing, plus it was fun to conduct a few art workshops to complement all the fantastic expertise ranging from ornithology, history and marine biology. It has been my long term project to record and raise awareness about the fragility of these natural wonders as well as try to express their inherent beauty. 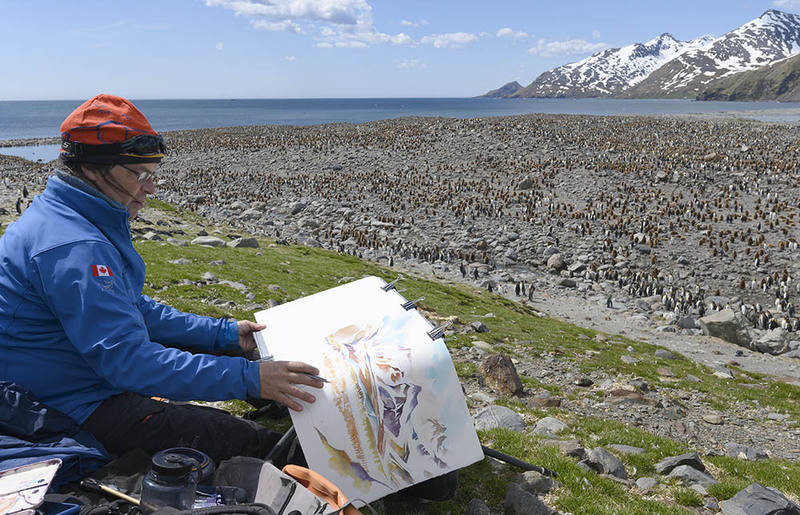 Many other painting from these regions and be seen on his websites Antarctic Galleries. Many thanks to One Ocean Expeditions and the hospitality in the Falklands for a successful voyage. So much reference material for future creations and upcoming presentations! Black Browed Albatross, West Point Island. Video impressions and painting clips from a recent trip last month to the Falkland Islands while on route to South Georgia. Along with the fantastic diversity of bird life the highlight here is the colony of king penguins at Volunteer Point. Had several days of sunrise on white sand beaches and painting the colony at sunset with the curious “woolly” young penguins. I am humbled to have been awarded the prestigious A.J Casson Medal, from the Canadian Society of Painters in Water Colour, at the 93rd annual “Open Water” juried international exhibition held in October 2018. The awarded painting, “Surfacing” (30 x 22 inches) , of a swimming polar bear among iceberg remnants was inspired by a recent painting trip to the arctic in which I has been studying for many years. It is rewarding when the elements come together to make a successful and effective composition thus can reach out to larger audience to communicate issues of climate change and conservation. “The Canadian Society of Painters in Water Colour (inFrench: La Société Canadienne de Peintres en Aquarelle), founded in 1925 is considered to be Canada’s official national watercolour Society. The nation's oldest medium specific arts organization has had an illustrious history. Membership is looked upon as a mark of achieving peer recognition in one of the most difficult and demanding visual arts form.